We here at E-Cigarette Empire are happy to introduce yet another stellar e-liquid that we have stocked our shelves with. The mixologists over at Villain Vapors have created yet another delicious line of premium e-juices that has had us mesmerized. 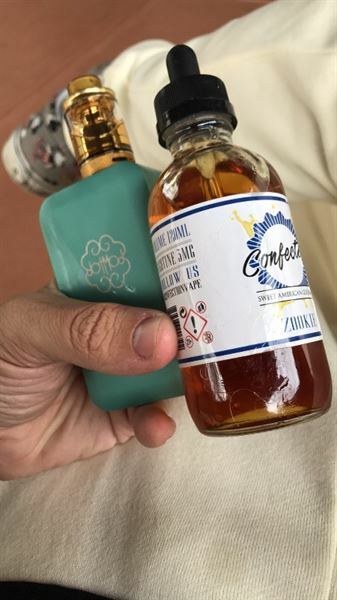 Zookie by Confection Vape is a scrumptious e-liquid that has been making a big buzz on social media, and we can see why. It tastes incredible and a very genuine flavor that perfectly mirrors the real dessert. Zookie by Confection Vape is profiled to taste like a warm sugar cookie, stuffed with blue berries, topped with a lemon zest, and followed by a big scoop of vanilla ice cream. We found that from our first hit, the flavor is very strong and it leaves a strong aftertaste, so if that what your into then give this e- liquid a try. On the inhale of Zookie by Confection Vape you will taste the sweet sugar cookie and blueberries. It is on the exhale that the lemon zest appears and lasts well into the exhale. Zookie by Confection Vapehas a smooth throat hit that is not harsh nor overbearing. This e-juice comes in a 70%/30% VG/PG blend. This means not only will you get strong flavor, but you are also going to get some thick and chunky clouds. This e-liquid comes in blue and white box with a picture of a soft serve ice cream, topped with blueberries, sugar cookies, and a lemon. In the middle of the box sits the e-juice brand name “Confection” and the e-liquid name “Zookie” printed on the bottom. The bottle is white, and has the logo printed on the label. We carry this e-juice in 0MG, 3MG, and 6MG nicotine levels in 120ML bottles. Don’t let this one pass you by, grab a bottle of Zookie by Confection Vape today! It was for my adult nephew who is now using vaping and has totally stopped traditional smoking. He loves this flavor the best and feels better also. Tastes pretty good, makes a good mixer. I've been buying the 120ml of zookie e juice by confections vape for over a year now and just can't find a better juice for every day. I have friends and family who don't vape but always are sneaking puffs from me when we go out! Pretty good, but your settings have to be dead on to get good flavor.